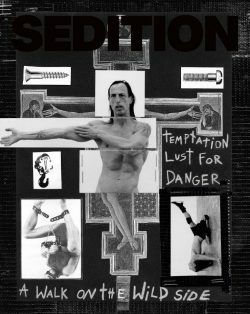 Sedition Issue 3, is about THE WILDNESS of YOUTH and is dedicated to its readers around the world who are dreamers and yearn for a time when fashion HAD GUTS and dressing was a way to REVOLT!!! In this third issue we set off around the world to photograph beautiful and dangerous youth with attitudes ON DISPLAY. These kids are REBELLION. They are the RIOT. THEY WILL incite you to kick back against authority and the status quo. The issue features a special edition cover and VERY JUICY coming of age INTERVIEW with eponymous fashion designer RICK OWENS as well as an editorial retropsepctive photographed by artists Sofie Middernacht and Maarten Alexander. Two additional covers, art directed by Sedition’s intrepid Creative Director Lana Jay Lackey, feature Indira Scott lensed by Justin French, and Alina Bolotina photographed by Tyler Kohlhoff. Marfa Journal is a new printed publication inspired by Marfa, Texas and created by artists for artists. A capital of cultural disorder, Marfa, Texas is a small town of just over 2,000 people located in….